Kate Marks, the Environment Agency’s Deputy Director of Flood Risk Mapping, Modelling and Data explains the background to the most recent changes in how we communicate flood risk. I love a good map, I even teach map reading in my spare time! For at least the 13 years I’ve been with the Environment Agency, maps have been a good way of communicating flood risk to the public. But we know they don’t work for everyone. Take many of the people I teach, when they start they’d be hard pushed to find their own property or local river on a map, let alone use the map to judge their flood risk. Our research with customers has shown that most people prefer to put in a postcode to select a property of interest and then see simple information about whether the specific address is at risk of flooding and if so what action they can take. The 520 metre-long flood barrier in Paull, East Yorkshire. With one in six properties in England at risk of flooding, it is an essential part of the Environment Agency’s role to tell people about flood risk. So we’ve listened, and changed how we present this information to make it easier for people. 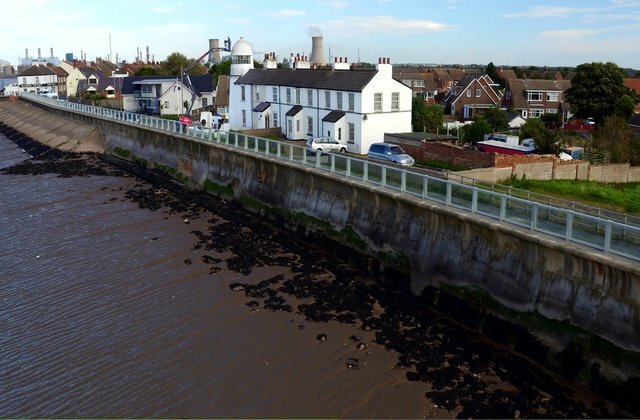 We have launched a new service that allows people to check the longer term flood risk to a property, alongside existing services that show the immediate flood risk in a location as a result of current weather conditions. This longer term information shows the risk of flooding from rivers, sea, reservoirs and surface water and is primarily used by people considering buying a house, obtaining insurance or wanting to understand if their home or business is at risk. Another important change we’ve made, based on research and your feedback is to give clearer advice on the action people can take to prepare for flooding. This may include information on whether there is a flood warning service offered in the area, how to make your own property more resilient to flooding and where to get help during a flood. If you love maps like I do, they are still there, and the information we show on them has also improved. There’s now a simple view of the areas at risk of flooding and a more detailed view you can use to see information such as likely depth and velocity of flood water. The data behind the maps is still shared free of charge, where possible, as Open Data or licensed data to encourage others to include it in their maps and information services. We want to ensure that everyone has access to the best Environment Agency data so that people are better informed about their local environment – one example of how this data is used by others is the environmental search reports which people obtain when buying a house. We are continuing to improve our digital services for people to check if they are at immediate risk of flooding, based on feedback from users of the website. 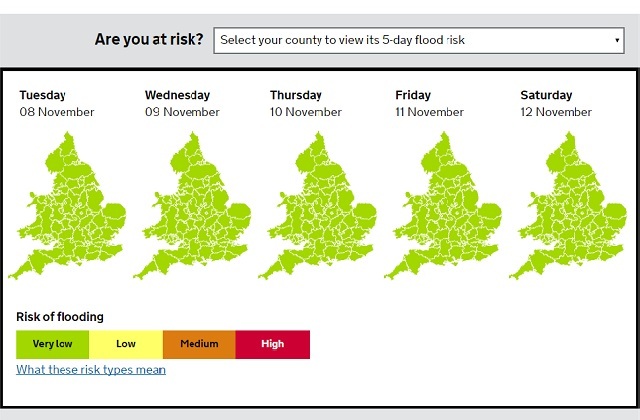 We recently added 5-day flood risk information showing the forecast flood risk at a county level across England and Wales. We also have plans to extend our service that shows current river levels to offer river level predictions in the next few hours or days. This is all part of the important work that we’re doing to improve the way we communicate flood risk as outlined in the National Flood Resilience Review. We’re still listening, learning and evolving the service, so please continue to feedback what else you’d like to see. I won’t be offended if it’s not a map. Risk maps are useful, but so also are solution maps. Catchment Process is a path to flood alleviation. Rainfall is a key input to Catchment Process. Please can you make Met-office rain gauge data OPEN (ie as you have done with Lidar relief data). This article relates https://atrepo.com/catchment-process-and-open-data/. Before I bought my house a year ago, I checked the Environment Agency's maps, and was pleased to find that the are was not at risk from flooding. The latest maps show that it is at high risk from flooding, which has obviously affected my insurance and the value of my house. I agree, exactly the same thing has happened to us, although we bought seven years ago. We now want to sell and can't find a buyer, I suspect people are viewing the information and being put off buying. It seems unfair as we were none the wiser when we bought our house. We have produced the flood maps with the best and most up to date information available. If you feel that the maps are incorrect and wish to challenge them, or you would like information that was used to update the maps, please email us at the following email address: enquiries@environment-agency.gov.uk with the address and postcode for your property and the specific details of your query. Our team will then forward your enquiry to the appropriate local team to look into. Regarding Surface water flood maps, I find them completely inaccurate. In some cases they do not include roads and show risk of surface water where there have been buildings for over 4 years. I cannot believe this information is used for searches and really hope it isn’t used by insurance companies as this would be really unfair for the house owners in these areas. This needs to be 100% accurate, which according to the disclaimer they are not sure enough to accept any liability. This is ruining people’s lives with causing insurance premiums to rise and making it difficult for people to sell houses. Please scrap the surface flood water map or stop it being used in searches. I think it is unfair that the surface water mapping can be used for any commercial use, when you have a disclaimer to say it cannot be used for any individual property as it is not accurate. This could cause issues with insurance premiums and ability to sell a house. I can give examples of where the map does not include roads and shows surface water flooding where there has been buildings for over 4 years. Unless the data is 100% accurate and liability is excepted for any mistake it should not be used for commercial purposes such as insurance or property searches. Really until accurate, it should not even be made available to the public.